It's my favourite time of year... Magazine FREEBIE time! A beach bag here, a mascara there - those UK Magazine's are so kind to us in Spring/Summer. 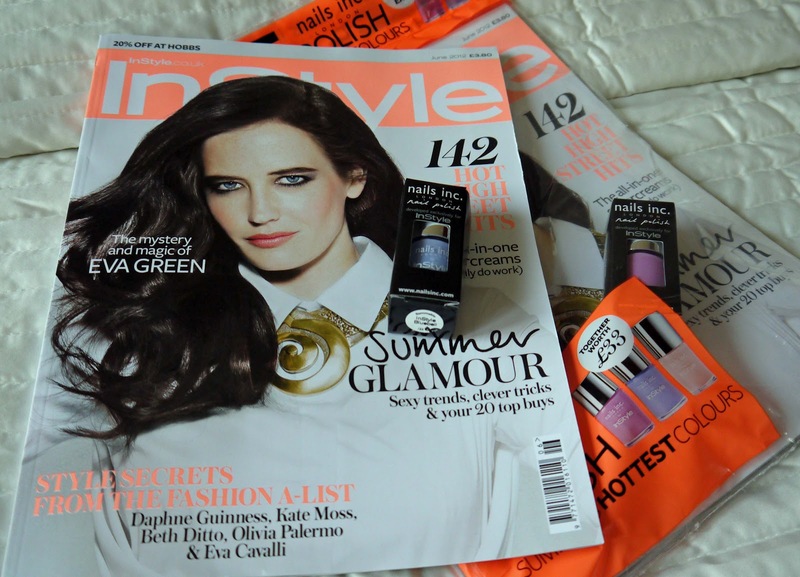 Grab a copy of this months' Instyle Magazine, out now to bag an exclusive Nails Inc polish. 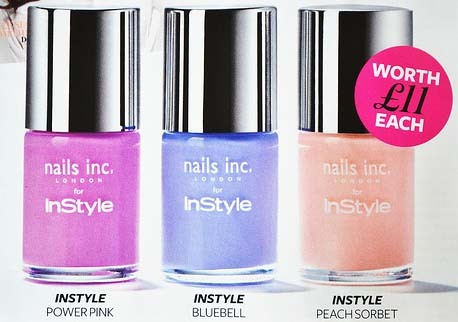 There are three colours to collect Power Pink, Bluebell and Peachsorbet. It's great to see some on-trend summer shades instead of the usual pink or red! I couldn't choose between the gorgeous pastel shades, but finally settled on Bluebell and Power Pink. I was going to complete the set with Peachsorbet, but it looked very pale, more of a pale pink than peach and I have lots of those. I got great coverage and true bottle colour with two quick coats. An £11 nail polish for £3.90... Love it! Also check out this months' Marie Claire Magazine for a free Body Shop Lip or Cheek Tint and Red Magazine with free Jemma Kidd products. oooooooo im just off to morrisons now so glad i saw this first i will definetly be getting one!